Our solutions span the entire technology spectrum in the areas of Converged Networks, TDM and IP Telephony, Data Solutions, Structured Cabling and Special Systems that include surveillance and multimedia applications. We can design, engineer and retrofit a state-of-the-art security solutions to fit any client's specifications, needs or budgets. Plan B Networks special systems division is committed to keeping your investment protected and help you maintain a low total cost of ownership. In today's economy, businesses and institutions become easy targets for crime. Many companies still do not invest in proper site surveillance and protection. Businesses are easy targets prone to robbery and theft of high value office equipment. Institutions are having to protect their clients from personal injury. Surveillance and protection has been elevated to a fundamental business requirement. Plan B Networks offers total security solutions to aid with those issues. We can design, engineer and retrofit a state-of-the-art security solutions to fit any client's specifications, needs or budgets. We have single IP camera options for small businesses and multi-camera CCTV with server applications for medium to large businesses. We also offer archiving of video for data reviewing to check on past incidents. Plan B also offers remote client monitoring so clients can view their property anytime, anywhere. Plan B Networks specializes in providing complete network solutions tailored to the specific needs of each client. Plan B Networks is the IT Company that truly knows how to "Simplify IT". You deserve a no hassle IT solution that meets all your needs and expectations. Our team of experts and professionals are ready to offer you the capability to start or to expand your network. Plan B Networks has developed engineering processes and quality practices that ensure the best design and installation methodologies that is the best value for our customers investments. With a large portfolio of services and solutions, Plan B Networks is the only Structured Cabling contractor you will need. 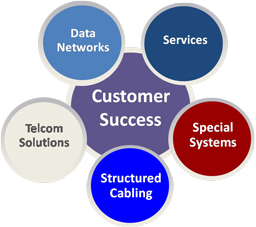 There is more to cabling system performance than just buying good quality cable and connecting hardware. In order to ensure full bandwidth potential, a structured cabling system needs to be properly designed, installed, and administered. In recognition of these critical factors, Plan B Networks has developed engineering processes and quality practices that ensure the best design and installation methodologies that is the best value for our customers investments. Plan B Networks has been in operations for over 5 years and has over 80 years of experience between management and technicians. Customers range from small, single site locations to large, multi-site educational institutions, national corporations and everything in between. Plan B Networks services and product offerings are designed to help eliminate today's barriers to efficiency, productivity, speed and performance by simplifying networks and connecting people to the information they need, when they need it! Plan B Networks is a recognized leader in delivering communications solutions and services that make our promise a reality for customers. Our solutions extend into next-generation technologies and address the needs of multi-media and business critical applications for our customers. Plan B Networks has been in operations for over 5 years and has over 80 years of experience between management and technicians. Customers range from small, single site locations to large, multi-site educational institutions, national corporations Networks services and product offerings are designed to help eliminate today's barriers to efficiency, productivity, speed and performance by simplifying networks and connecting people to the information they need, when they need it! By offering services ranging from maintaining your existing PBX to designing and implementing full voice and data networks, Plan B Networks can truly be your "one-stop-shop" for your business communications. Telecommunications has taken on many changes in the past recent years. With the convergence of voice and data networks, the options for telecommunications and multimedia applications has increased tremendously. "Voice over Internet Protocol" or VoIP has moved into the communications mainstream in a big way . Many businesses are replacing conventional phones in favor of VoIP, and startups are selecting VoIP from the get-go. VoIP is gaining popularity among business owners and institutions for good reasons . Plan B Networks understands these business and communications dynamics and is prepared to provide the solutions that best meet the needs of our customers. Plan B Networks has a long reputation of customer service and support. Successful implementations and focus on customer loyalty has helped the company grow to new heights. Plan B Networks technicians have an excellent reputation for their knowledge of the latest technologies and commitment to delivering the best level of service possible to the customer. From the beginning, Plan B Networks has been a service-oriented resource to Business Services Partners (Nortel Partners and Customers in particular), providing technical support for installation projects, warranty/maintenance work orders and system upgrades. However, today we have evolved into so much more. Essentially, we act as an extension of your office. Think of us as your partner who provides extraordinary service and support for complete voice and data solutions. Plan B Networks has a commitment to build alliances with best in class software and hardware providers to serve the needs of our clients. We partner with technology leaders, which allow both Plan B Networks and our alliance partners to grow synergistically and deliver greater value to mutual clients. Some of our alliance partners include: ShoreTel, Microsoft, Nortel, Cisco, HP, Arecont Vision, Panduit and OnSSI. We focus on our customers' success and engagements to ensure they obtain the business results intended for their investment.